A batch of birthday cakes! Last weekend I was hard at work creating 3 birthday cakes! The first cake was designed for a big fan of the video game “Guitar Hero.” Carrot cake was shaped into a replica guitar and was approximately 3 feet in length! The cake was topped with buttercream icing and fondant. This entire cake was edible! The colored buttons were made up of fondant covered starbursts, the whammy bar was a chocolate covered peppermint stick, and the other buttons were rolos and fondant covered tootsie rolls! This guitar was a bit hit! 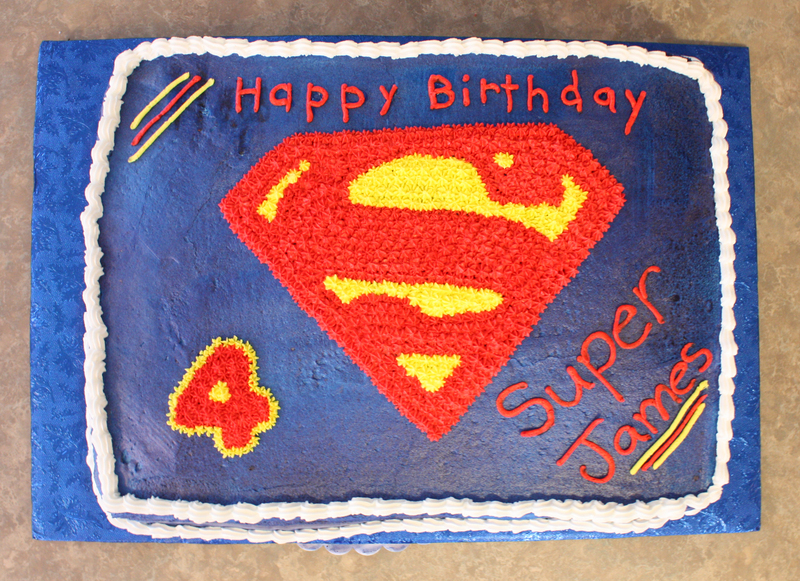 The 2nd cake was created for a 4-year old superhero! It was a half sheet cake – chocolate fudge (11×15), with buttercream in the center. It was personalized and decorated with the superman emblem. 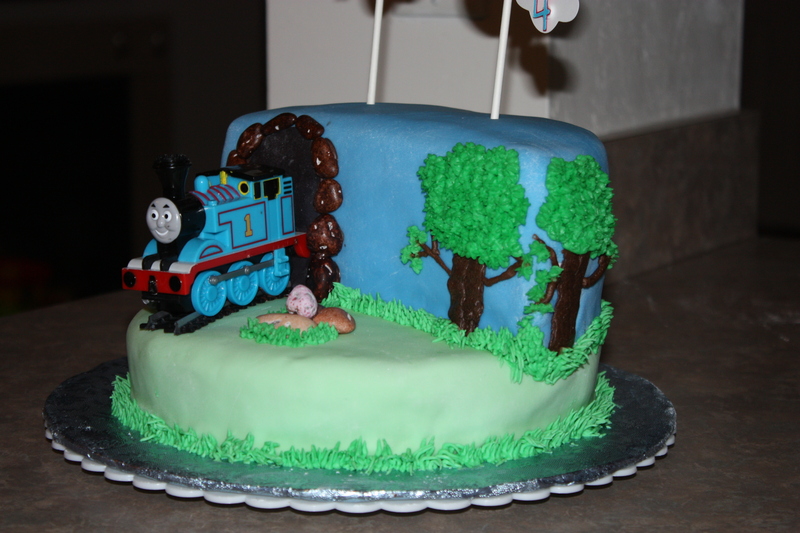 The final cake of the weekend was for another 4-year old… but his passion is trains! 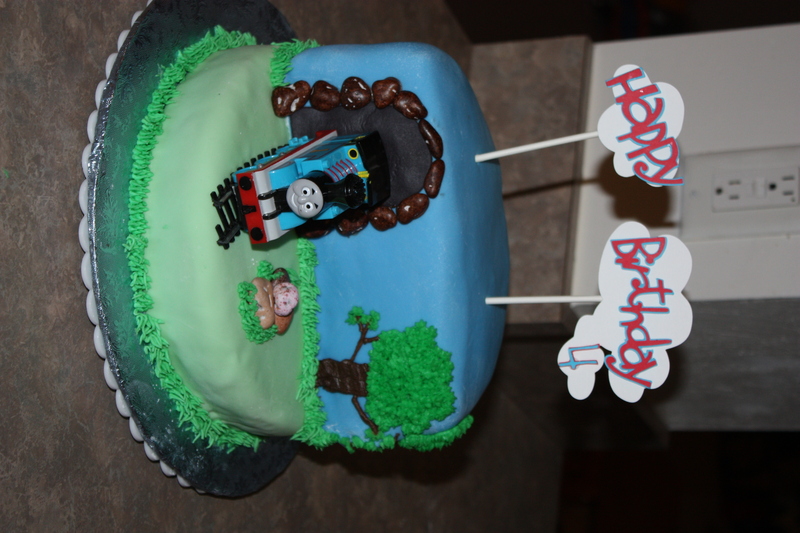 I created a scene with a train coming out of “cave.” The cake was made up of two 9 inch cakes – chocolate fudge flavored (one cut in half to form the hill). The cake was covered with blue and green fondant, while the trees and grass are made up of buttercream icing. The rocks are edible chocolate, and Thomas and some tracks completed the scene. The clouds and “happy birthday” were cut from my cricut. 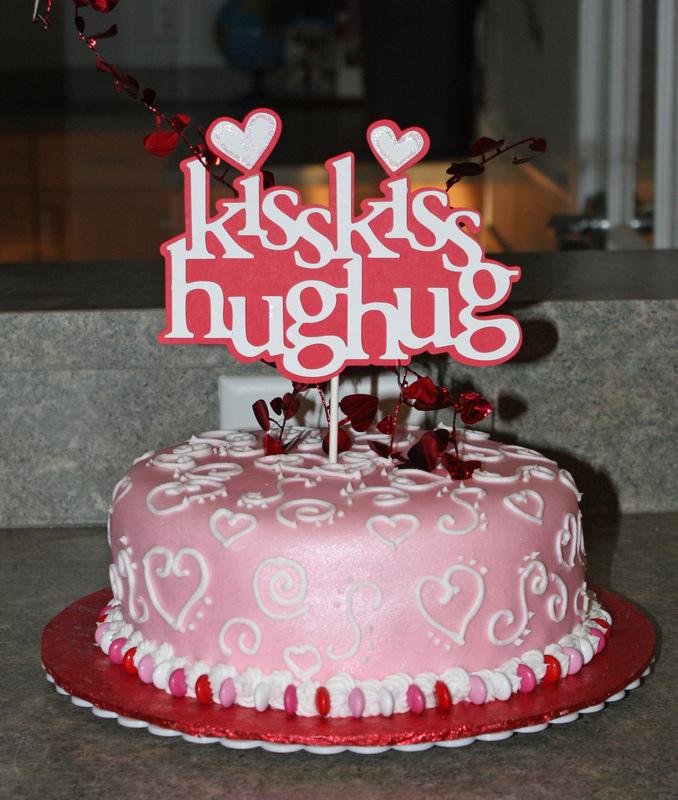 This cake was made for a group of wonderful families in celebration of Valentine’s Day! The cake is made up of two 9 inch strawberry cakes with buttercream filling in between. It was covered with soft pink colored fondant combined with a pearl shine. The designs on the fondant were made up hearts and swirls, while the border was altnerating colored m&m’s. Finally, the cake was topped by a design using my cricut machine.